EGBOK has a lasting impact. Understand what we do in 5 minutes. Watch the video. Thanks to your support, we give life-changing opportunity. Alumni have a starting salary nearly double the Cambodian national average annual income. EGBOK alumni are employed by some of the top hotels, restaurant, and spas in Cambodia, including Starwood’s Le Méridien, Park Hyatt, Aman Resorts, Accor’s Sofitel, and Raffles. The students in our program, primarily ages 18-22, undergo an incredible transformation on many levels. Through our services and activities, it is certainly a path of self-discovery to find their inner strength during this pivotal phase of a young adult’s life between their teenage and adult years. Every student we work with has a story and each story is inspiring. From a difficult childhood to a top-tier hotel, Chanthy’s positive attitude and aptitude for learning have taken her far down a road toward future success in whatever she can dream to be and do. After spending his childhood in an orphanage, Kea's ambition drove him to enroll in EGBOK's program where he excelled academically and professionally. 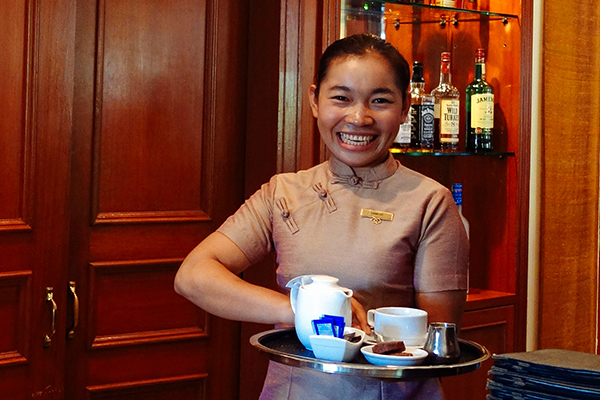 Kea now proudly works at a top international hotel in Siem Reap and continues to receive promotions. Geared towards a future of rice farming in her village, Veasna never imagined that she would have a successful career in hospitality. Once shy and insecure, Veasna's newfound confidence has helped her reach goals she never previously imagined.